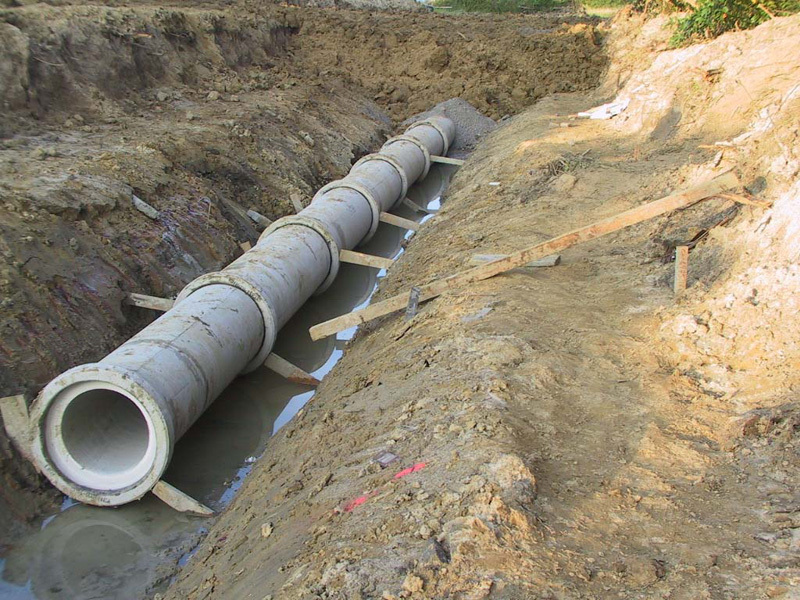 Precast concrete pipes and accessories (in mass or reinforced concrete) are an economical and sustainable solution, suitable for sanitation facilities intended principally for black water, rainwater and surface water piping, using gravity or occasionally low pressure. The bell and spigot type concrete pipes by PREFABRICADOS ALBERDI, S.A., used in open construction works or piping in trenches, are manufactured using the radial compression system. This manufacturing process for concrete pipes consists, essentially, of compaction using double rotating head with counter-rotation, which exerts a radial compression force against an exterior mould, in combination with a vertical movement. This manufacture method for concrete pipes achieves resistance and a good finish, and precise dimensions within very low tolerances. In the case of reinforced concrete pipes, the reinforcement is manufactured automatically with a contact-welding machine. This reinforcement, to avoid displacement during manufacture and to guarantee the coating distances, is secured with a system that is later retracted, which positions the reinforcement perfectly. Once the mould has been filled, it is immediately demoulded and the concrete parts are then steam cured, so the concrete sets uniformly and premature dehydration of the concrete is avoided. At ALBERDI you will find different types of concrete pipes depending on the manufacturing process, the type of reinforced or mass concrete, or the installation conditions (in trenches or jacking pipes).